I was prepared to fall in love the minute we walked into Jay's. The place is homey. The walls are a soft green with beadboard wainscoting. The waitress was friendly and greated us with a warm, "Sit where you like." Even the customers were accomodating - two of them moved so that we could push two tables together and create a table for six. 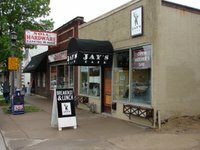 There is a maximum capacity of 45 at Jay's, so it's a hole-in-the wall type of place, with small tables (but not too small) and fair-trade coffee. There's a magazine rack with the day's newspaper next to one of the tables. It can get loud, because it's a small room, or it can get unnervingly quiet, when the rest of the diners all decide to stop talking at the same time, and the only voice in the room is your own. The menu had so many good-sounding options, that we had a hard time making our selections. Before our food came, there was a pervading feeling of optimism among the club members. Could this be The One? Beau and Jimmy ordered the "Cowboy" breakfast, with steak, bacon, eggs piled on top of their potatoes. Judy succumbed to the temptation of the daily waffle (orange and almond) with her real maple syrup and whipped cream on the side. Rachael and I had the thing that was most like Eggs Benedict. Sarah, true to form, got the burrito. My food was first to arrive. Fingers swooped in from all over the table to sample my potatoes. It's been a long time since we've been to a new restaurant, so we all wanted to see how the potatoes stacked up. They didn't. They were at once soggy and dry. The spice blend was OK, but it just didn't make up for the texture. The potato problem was like being on a blind date and finding out the dude was a Republican. Could you see beyond it if he had lots of other really good qualities? Judy shook her head, wrinkled her nose, and gave a definite thumbs down. Oh, we wanted to love this Jay, because he was so good looking, but he kept giving us reason to doubt. Beau and Jimmy plowed through their meal, Beau polishing off his plate and Jimmy leaving the rejected potatoes behind. They later admitted that the steak was also a disappointment. Rachael, on the other hand, liked her meal and she and Beau were the only Clean Plate Club members. I had the same thing, but I got tired of the pile of cooked spinach under my eggs, the hollandaise version didn't thrill me, and I kept coming back to those potatoes - those limp on the outside, dry on the inside potatoes. After a while I didn't even like the spices anymore. Sarah ate half of her burrito. I couldn't tell whether that was a bad sign, though, because the thing was enormous, and sometimes she knows her limits. Judy seemed happy with her waffle, but Jimmy was not impressed when he finished it off for her. At the end of the meal, a very divided breakfast club left the table. The Cowboys gave the place a D, probably because their meal depended so heavily on the potatoes and the steak. Judy was more in the B range. I said C+, because the ambience was exactly what I want in a breakfast joint. I think the conclusion was that we could come back, but only if we altered our ordering habits and substituted fresh fruit for potatoes. That way, we could enjoy Jay's good looks and charming personality without running into his unfortunate potato problem. Sad but true...the potatoes and the hollandaise are non-repeatable...the bacon was perfecto and the toast excellent as well. That leaves me with a bacon, toast and a side of fruit option.J. You can't have breakfast of toast and bacon, but, hey, we all love BLT's don't we? Don't let's forget about Jay's when we have Breakfast-lunch club. You know...I've been a member of a Twin Cities group called "The Breakfast Club" too. We have been scanning breakfast establishments for about 6 years now. Maybe we can combine review powers. Anyway, Jay's has become one of my top 5 breakfast places. I have not had the Cowboy breakfast, but the Eggs Sardau is amazing. What characteristic's make good potateo's? Crispy? Spice's?